A team of Junior Wardens joined Derby Homes, Woodhead and OSCAR to decorate the hoardings with Site Artwork on Victory Road in Osmaston. Woodhead Living, the specialist sustainability team of construction contractors Woodhead who were commissioned by Derby Homes through procurement consortium, Efficiency East Midlands, earlier this year to build five new properties on a Victory Road site, where two homes had been demolished. Since breaking ground at the end of May, the team has been working closely with Derby Homes and OSCAR (Osmaston Community Association of Residents) to involve members of the community in the regeneration of the site. As part of its commitment, Woodhead has, for the first time asked its sub contractors and partners to sponsor the newly decorated hoarding panels that surround the site, in order to raise money for the local community. At the end of the scheme in early 2015 the money raised will be donated to the Osmaston community to re-invest in the area. 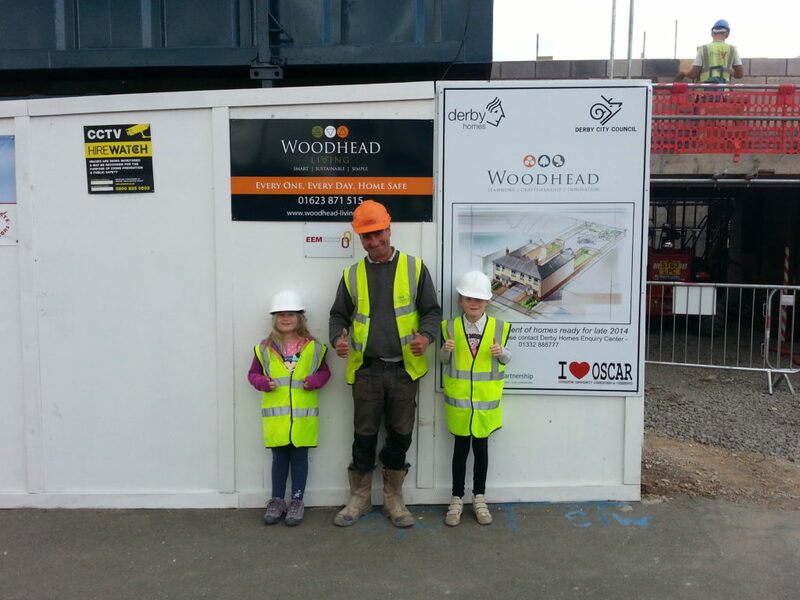 Woodhead’s site manager, Paul Pygall, has asked the Derby Homes Junior Wardens to come along and decorate the site hoardings with images and messages to promote road safety, recycling and safety around building sites. It comes as the site’s second visit from the Considerate Constructors’ Scheme (CCS) yielded an exceptional score of 43 out of 50. This is the best score Woodhead has ever achieved. Paul said: “It’s really important that when we’re working within a community, we are operating as part of that community and involving local people as much as we can. “Site hoardings are normally pretty boring, and we thought it would be nice for local young people to use the expanse of space here to promote important messages using their own creative skills. Members of OSCAR hope to use the money raised to enable them to take more children on their annual seaside camping trip. Leigh Alcock, Chair of OSCAR, said: “It’s great to have the children and young people involved in the project. Shaun Bennett, Director of Investment and Regeneration at Derby Homes, said: “There is a huge amount of construction and regeneration in Osmaston at the minute. Together with OSCAR and the council we are making huge strides to transform the estate, providing warm, secure and efficient homes, to meet the needs of the local community.